It is really coming down out there now. Here is the latest weather alert. SNOW WILL CONTINUE THIS EVENING AND MAY BE HEAVY AT TIMES... ACCUMULATING AT THE RATE OF AROUND 2 INCHES PER HOUR. TOTAL ACCUMULATIONS OF 6 TO 10 INCHES ARE LIKELY BY THE TIME THE SNOW TAPERS OFF LATE TONIGHT. WINDS COULD ALSO BECOME QUITE STRONG DURING THE PERIOD OF HEAVIEST SNOWFALL. NORTHEAST WINDS OF 15 TO 25 MPH WITH GUSTS UP TO 35 MPH MAY CAUSE NEAR BLIZZARD CONDITIONS... WITH CONSIDERABLE BLOWING AND DRIFTING OF SNOW AND SIGNIFICANTLY REDUCED VISIBILITIES. In other news today. Had lots going on at work. Several things happened this weekend and late last week that caused everything to collide today. So it was very busy. I also had some 1,800 pieces of non-profit mail in my car that had to go to the post office and get mailed. Saturday, I was in the city working with several other volunteers preparing the official invitations to our April 2nd Night of a Thousand Gowns event. We had everything split out by zip code and had to prepare the mailing to USPS specifications. So, since I am the Secretary and the primary contact for our non-profit permit, I took it over to the post office and got it taken care of. After our annual fee and everything, we saved the organization over $200. The even bigger saving will be the second mailing we do in a year since we do not have to factor in the annual fee to that mailing. Anyway, lots of snow outside. Going to make dinner and watch a movie. I am sure glad the storm is going to hit this week instead of next. I am supposed to be on a plane to Ohio at this time next week. Would hate to be in Ohio and get stuck there. Oh well. Here comes another storm to dig out from. Have never seen so much snow until I moved here. Portland and Grants Pass, Oregon were both down in the valley. We would get snow, but nothing like this. THE NATIONAL WEATHER SERVICE IN UPTON NEW YORK HAS ISSUED A WINTER STORM WARNING. SNOW WILL ARRIVE LATE MONDAY MORNING OR EARLY AFTERNOON... AND MAY BECOME HEAVY AT TIMES LATE MONDAY AFTERNOON AND EVENING. CURRENT INDICATIONS ARE THAT 8 TO 14 INCHES OF SNOW COULD FALL BY THE TIME THE SNOW TAPERS OFF LATE MONDAY NIGHT. WINDS COULD ALSO BECOME STRONG DURING THE PERIOD OF HEAVIEST SNOWFALL... WITH CONSIDERABLE BLOWING AND DRIFTING OF SNOW AND SIGNIFICANTLY REDUCED VISIBILITIES. There is going to be a new Nickel on Tuesday. We are going to get a ton of snow on Monday afternoon and Tuesday. But, go ahead and check out the new Nickel. New Nickel front New Buffalo Nickel "Ocean in view! O! The joy!" Could not figure out the one so yanked it out and put this one in. This will work just as good and is easier than the other code was. Think I'll finish up and head back home. Need to get gas before everything hits tomorrow. Suppose I should head over to the market and get some fresh fruit. Need milk too. Over at Starbucks (where else) just playing around with my web site right now. As you can see from my office, I am a Harry Potter fan. 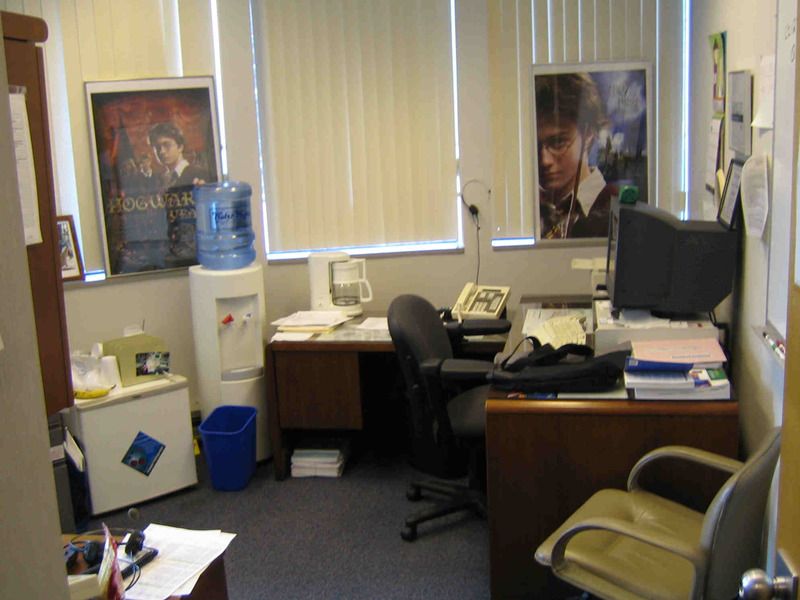 Everyone (well, mostly everyone) enjoys the Harry Potter posters in my office. I offered to take them home but my office partner said no. He did not mind them and liked them up. Added character to the office. Watching Battlestar Galactica on the SciFi channel right now. Updating this during commercials. Here are some shots that I took today. I have to figure out how to save these in a smaller resolution to save space. Mr. Teddy likes to sit at my desk and eat oatmeal in the morning. Yes, this is my messy desk. My office. My desk is to the left. Last night was a snow night. Even the Fire Academy was closed. It started coming down around 4pm and by about 10pm we had 5" of snow. So, time to go get the snow off of the car and head to work. Pics from my new digital Canon PowerShot SD300 camera this evening. Finally bought a new digital camera. Here is a current photo of me that I snapped on auto while learning my camera last night. In the background you can see a picture of my niece, me and my mother from when they visited NYC. It's a picture that is on my wall. Here are a few shots I took last night. Look for more in the future, especially when I attend events. I have the big Night of a Thousand Gowns here in NYC on April 2nd, then I will be in St. Louis for their very first event on April 9th. Then later that month I am in Rhode Island for their coronation. I am in Cincinnati for business on March 7th. It is snowing hard outside. Guess it would be a good time to head home and snuggle down for the evening instead of here. About a 1/2" on the car already. Very wet snow. They say it is going to snow through the morning commute. So that is going to make things interesting. I still have some laundry to put away. Just sitting over at Starbucks finishing up some things. Going to snow tonight. The weather service says 6-8 inches tomorrow morning from 3am to 9am. So should be interesting. Guess I should go to the store and stock up on some food. Had my meeting with the Police Captain. He misread my records from Oregon. The items he was looking at were "related incidences" as in when I got hit by a DUI driver, it was on my record because I was involved. So, I called the Fire Chief yesterday and left a message that I want to start the application process again. Talked with one of the guys from the department during an EMS call at the lab last week. He indicated that Engine Company 1 really needed members. So we will see when the Chief calls me back. Had a great time in Connecticut the other weekend. Did laundry today too. Just getting caught up on some work at Starbucks. Has been rather busy recently as you can tell from my lack of postings here. A friend just noted that one of my photo galleries was not working. Turned out that I had deleted it and forgot to take off the link. Oops. Had a nice weekend in Connecticut. They had their annual coronation in Windsor this year. It's north of Hartford and south of the Bradley International Airport. Jeffrey and I went out to the New England Air Museum and toured around. They have a very nice collection which includes an inside display of a B-29 Superfortress as part of their 58th Bomb Wing Memorial. They had some great looking exhibits on display outside, but that was closed due to the ice and snow. Afterwards, we went over to the local mall and did some shopping for that night. The ball was nice and a good time was had by all. Trying to get some minutes typed, so need to get back to them. Fire School tomorrow. The State of Oregon is honored with the third quarter to be released in 2005, and the 33rd in the United States Mint�s 50 State Quarters� Program. On February 14, 1859, Oregon became the 33rd state to be admitted into the Union. Its coin design features a portion of Crater Lake, the deepest lake in the United States, viewed from the south-southwest rim. The design incorporates Wizard Island, as well as Watchman and Hillman Peaks on the lake�s rim and conifers. The coin bears the inscription "Crater Lake." Crater Lake is a unique and stunning natural treasure, formed more than 7,700 years ago by the collapse of Mt. Mazama in what is now southern Oregon. At 1,949 feet, it is the deepest lake in the United States and the seventh deepest in the world, and has a record clarity depth of 134 feet. The main cause of Crater Lake�s remarkable clarity is its isolation from incoming streams and rivers. President Theodore Roosevelt established Crater Lake National Park in 1902, with the lake itself as the Park�s crown jewel. It is the sixth oldest national park in the country. Since its creation, Crater Lake National Park has helped protect both the Native American cultural ties to the area and the natural habitat of the animal and plant life that lies within its boundaries.